AIMING to catch up with global competition and India's fibre requirement of the future, the Union Ministry of Textiles put up a draft national fibre policy on its website in June. It has invited comments and suggestions. Though India is the second largest producer of man-made fibre in the world, said the draft, its share in global exports of textiles made of such fibre in 2008 was a mere 2.25 per cent. 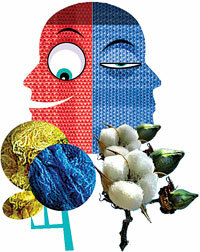 India's fibre consumption tilts towards cotton in a ratio of 59:41 compared to manmade fibre. Worldwide, the tilt is just the reverse where man-made fibre consumption is 60 per cent compared to 40 per cent cotton fibre. The global fibre consumption trend in future is likely to tilt further in favour of man-made fibre, the draft policy said. "Given that the future demand is expected to be largely in favour of manmade fibre-based textiles, special attention is required to boost the consumption and production," the draft noted. The key producers of man-made fibre in India are Reliance India Limited, Grasim, Indo-Rama Synthetics Limited, Century Euka Limited, Birla Cellulose. The draft policy estimates India will need investment worth `1,76,510 crore by 2020 to enhance capacity along the textile value chain— spinning, weaving, knitting, processing and garments. Critics have taken strongly to the overemphasis on man-made fibre. D Narasimha Reddy of Chetana Society, a Hyderabad NGO, said the policy has not spelt out a coherent strategy for farmers, who come first in the fibre supply chain. "Among farmers, cotton growers get more attention, while those who produce jute, wool and silk only get a passing mention," he commented. The policy has failed to address availability of cotton seed, prices and quality, he added. Nor does it suggest measures to ensure proper returns for farmers, who have been plagued by rising cost of production, Reddy said. "Once again industry has been given importance over agriculture." D J Gohain, managing editor of Textile Excellence and textile technologist, suggested the ministry should include ramie fibre in the fibre category requiring special focus. He pointed out that the government is promoting banana and pineapple fibres, which are still in nascent stage, but ramie already has a technology for cultivation, crop management and production. Gohain said natural fibres should be given preference as they grow from renewable resources. Man-made fibres are made from chemicals and petroleum. A Saktivel of Tirupur Exporters' Association in Tamil Nadu welcomed the policy. It will boost India's knitwear garment export, he said.